Based in the beautiful county of Sussex, UK, Earthy Timber designs and creates unique, luxury and exclusive wooden tables & live edge wooden tops for any high-end residential or commercial space. These are truly elegant, stylish wood & resin designer furniture to stir joy in your heart and soul. Bespoke wooden tables & tops for the discerning customer who is ready to invest in a piece of furniture that will last for generations to come. We are a timber yard with an in-house vacuum kiln drying chamber and earthy design studio, offering a diverse, beautiful and unusual range of waney edge wood slabs ready for your commission. 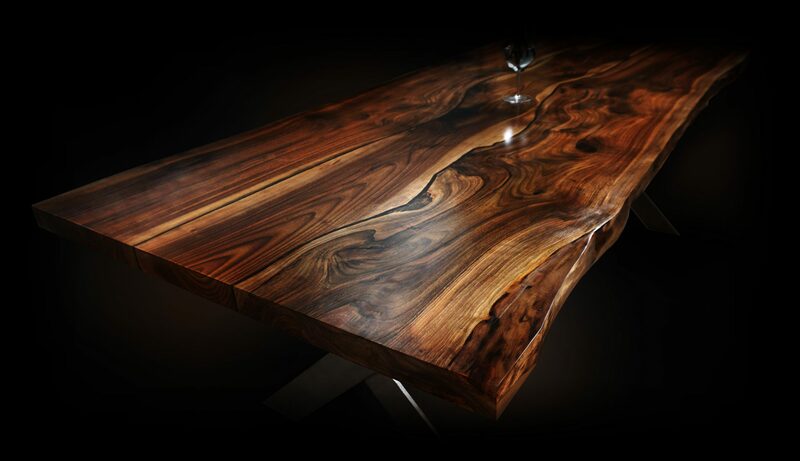 If you are looking for a work of art dining table, a unique wooden kitchen island artistic timber breakfast bar that will enhance your home, or perhaps large slab conference table or desk for your office please peruse our site and Instagram accounts for inspiration. With satisfied customers both nationally and internationally, when it comes to wood, we turn nature’s bounty into stunning and totally durable wooden tables & breakfast bars & kitchen islands & conference tables & vanity bathroom tops & desks of any size. Every piece of our solid wood furniture has stunning earthy features and is both unique and distinctive. Bespoke wood resin tables & tops from Earthy Timber maximise the beauty of nature, but with an artistic, modern twist to deliver striking, artisan perfection. Our wood & resin & metal work is modern, exclusive and cutting edge. With its natural patterns and knots and crafted to perfection, our wooden tables, desks and tops cater to elite, discriminating tastes. Here at Earthy Timber we have an eye for detail and an innate knowledge of how to develop a live edge slab of wood into an object of astonishing beauty. We have in depth expertise in wood, resin and metal enhancement techniques to best reflect light; the natural, live or bark edges of wood plank can also be preserved to display to most subtle or earthy & dramatic effect. Please contact us to arrange a visit to our wood yard & workshops to view examples of our high quality handcrafted products. Earthy Timber is truly unique in the United Kingdom and throughout the world. We are the only company of our type to present an all-in-one service to our customers. We source, vacuum kiln-dry, design and create each piece in our workshop in Plumpton Green, Lewes. In this way we oversee the entire process from start to finish, offering you the exclusive service that your investment with us deserves. What’s more, each earthy luxury wooden table or natural wood top will have unique features, brought to life with the utmost care and attention. We are unique and in the forefront in using highly advanced vacuum kiln drying process to remove the required percentage of moisture from wood (below 10%). The result is an artisan crafted wooden dining table, waney edge conference table, live edge breakfast bar, kitchen island wooden worktop or natural wood bathroom counter that will never warp, bend or crack. These are stable timber pieces that will last several generations. Earthy Timber sustainably sources selected wood logs from the UK. We work with a variety of wild-grown timbers, including more unusual ones, such as Cherry, Hornbeam, Wild Walnut, Sycamore and Wild Apple, to name just a few. Our work is exclusive, with a waiting list. Please let us know your investment figure so that we can consider this when establishing the most attractive design options and finishing techniques that will reflect your investment with us. In this way, the same size finished commission can vary in price from eg. £5000 to £50000, depending on the rarity & beauty of the selected timber planks, wood finishing techniques and the time spent on creating your functional piece of art. Each waney edge wood slab in our Plumpton Green, Lewes based timber yard is unique as we personally choose each log for its distinctive characteristics and features. The beauty of our earthy – modern commissioned furniture is our trademark signature. In our Everyday Range Store, you can make the purchase of less expensive, also crafted in house, quality wooden tables, breakfast bars, kitchen islands , full stave wide stave worktops, shelves, bathroom sink vanity tops, coffee tables or desks. To ensure that we can offer you the time and expertise that you deserve, we only see customers by appointment. Please use our contact form to send us the details of your project. We are looking forward to hearing from you. Visits to the workshop are strictly by appointment only. We look forward to creating your exclusive, luxury timeless piece of furniture.